Vanessa Brantley-Newton has illustrated several picture books, including One Love by Bob Marley and Let Freedom Sing (which she also wrote). When Vanessa isn’t illustrating a book, she is crafting and cooking and singing! She also hears color. When she says “hello,” she sees the rainbow, and when children giggle, she sees bright orange and pink! She lives in Charlotte, North Carolina. 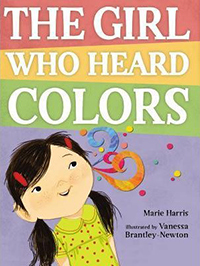 This eye-opening picture book introduces readers to their five senses and to synesthesia—a condition in which one sense triggers another. For some people, sounds or tastes have colors. And for others, numbers and letters do. Many famous artists have been synesthetes, including Tori Amos, Duke Ellington, Jimi Hendrix, Lady Gaga, Stevie Wonder, Billy Joel, John Mayer, Mozart, and Degas.